It doesn’t seem like it, but to hike the entire 2,660 miles in one year, I really needed to be almost into Oregon by now. Here it is, the middle of July, and we’re not even half way. The crux of the hike going northbound is determined by when the winter snow hits Washington State. Typically this is sometime in mid to late October. This year, however the weather is insane and snow could come in September, November or next week. Some forecasts talk of a “El Nino”, some a “La Nina” and all are guessing. It’s back to Dart Board Forecasts, folks. So, what to do… The goal was always to hike the whole trail in the same year. However, we were resigned to stopping at the Washington border and returning next year to finish. Then Mother Goose suggested an out of the box solution. First the numbers. So we decided to hike to Donner Summit, (Interstate-80) hitch to Truckee and take Amtrak to Portland, Oregon via Sacramento, CA. 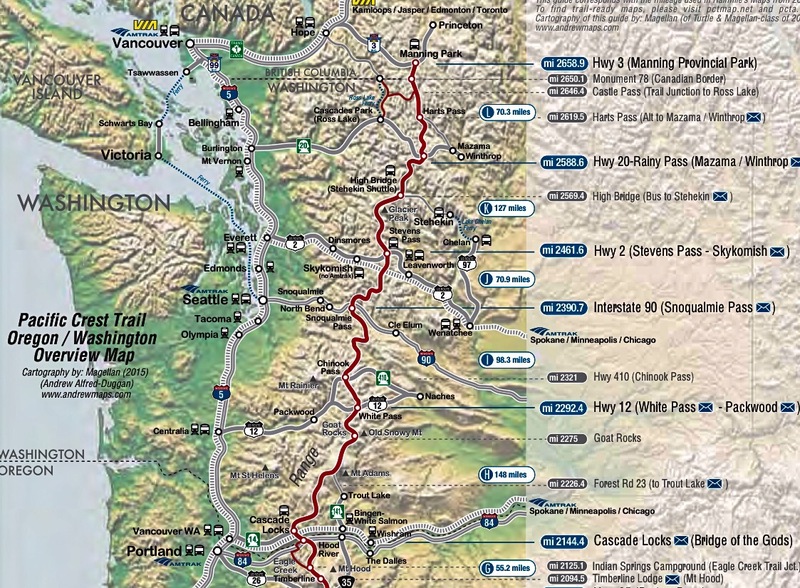 From Portland we can take a bus to Cascade Locks where the PCT crosses into Washington and hike to Canada. Sadly, while Amtrak goes through Cascade Locks it doesn’t stop, so no simple point to point. Once in Canada we take Amtrak back down to Truckee, CA and resume the hike. The biggest downside is hiking Oregon in the late fall, early winter where it will be very wet. While uncomfortable, it is at least doable. On the other hand, while summer in Washington may be warm it should be cooler than Northern Cal in July! So that’s a plus. Overall, we like this solution! That sounds like a great plan! I love having the map so I can follow your adventures. Have fun and be careful!